In the evening while we wait to get hungry, Ivy and I walk around her neighborhood catching up and watching the sky fade into dusk. It’s the middle of October, but the air is still warm and mild. The San Gabriel Mountains to the north are turning a familiar bruised shade of purple, and it feels exactly like so many shapeless nights of my childhood. I’m looking fondly at Ivy, her familiar round face framed by an unfamiliar haircut, new glasses. There is so much to talk about. We both grew up here, and by now we’ve known each other for almost 20 years. Unlike many of my childhood friends, I wasn’t born in Southern California. 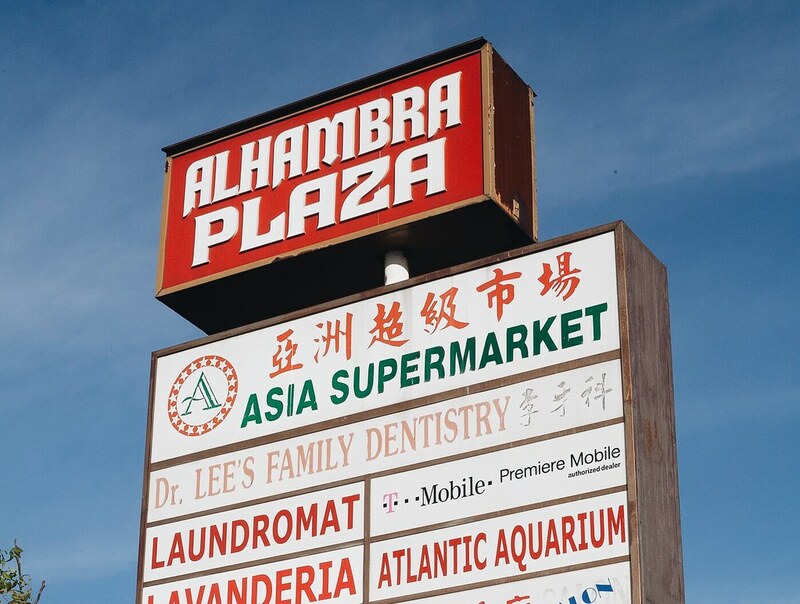 They were born in cities such as Alhambra, Rowland Heights, San Gabriel—distinct suburbs of Los Angeles that blur together in the mind of the Asian diaspora. Or maybe it’s the other way around—a blur to others, but distinct to those of us who’ve lived here. The first few years of my life were spent in Orlando, Florida (a fact that never fails to amuse friends) and the rural suburbs of Boston. My memories before California are of playing with neighbors in the woods behind our houses, sledding down our steep front yard in the winter, and then right before the move, a raucous New Year’s Eve party at a family friend’s house and the warm buzz of the adults as they anticipate all the unknowns of Y2K. Thanks to my mother’s new job, the new millennium begins and my family lands in Arcadia, California. There’s no way for me to know then that we are participating in a large-scale transformation of the region that began taking shape in the eighties. First, there are only the lucky few Chinese who have managed to sneak past the Chinese Exclusion Act and settle in the area. Then, in the eighties, a real estate developer begins heavily promoting the SGV, specifically the city of Monterey Park, to fellow Taiwanese immigrants as a place of prosperity. With the loosening of restrictions in the coming decades, mainland Chinese make their way into the rapidly growing community. Many of my friends’ parents trace similar stories to their lives in Arcadia—they were the best and brightest in China who managed to secure graduate positions at American universities and used that to propel themselves into lives as upper middle class professionals. They are engineers, doctors, scientists, and they are serious about their children’s success in this country. On one hand, life is idyllic. The streets are wide and tree-lined, the houses are big, and the lawns are well-manicured. The city is safe, clean, and has an excellent public school system, which becomes the driving force for the continued influx of Chinese families. The sun shines almost every day. There’s safety in numbers here, and peace of mind. These are the culture clashes familiar to any child of immigrants—offensive comments from white classmates about a strange lunch item, shame at a parent’s thick accent and visible confusion, racist taunts. But by the time I reach high school, a solid majority of my classmates are fellow Asian-Americans, and mostly Chinese-Americans. We share many things: memories of long afternoons at Chinese school, annual summer trips to the motherland, parents who push us to succeed academically, a courseload of AP classes. The coolest kids are the smartest kids. “Did you hear Nancy got into Princeton early decision?” we whisper, and an electric buzz will light up the senior class. In a way, though, this exact idealism either becomes the source of or feeds an intense culture of risk aversion. It’s a kind of subtle threat. “Listen,” it says, “if you don’t study hard and join the ranks of the respected and well-paid professions, there’s no way you can continue living this privileged life.” And after all the hard work and sacrifice of our parents, who wouldn’t want a life like this? Living in a safe, wealthy ethnic enclave of your own kind that experiences year-round mild weather is living the absolute dream. A wonderful coincidence: Arcadia, noun, a region or scene of simple pleasure and quiet. To pursue otherwise, to dream about art and history and strange paths that will take us far away from here, begs the question, why? I think I understand the fears of my parents’ immigrant generation. How in their lifetime they’ve gone from impoverished and always hungry to living in big, clean houses in the land of opportunity. How they’d like to protect their children from the hardships they once knew intimately. But I can’t agree with the techniques of close-mindedness and the relentless pursuit of status. There are well-accepted examples of this in the Asian community that go unquestioned, such as the battle for prestigious college acceptances and the strong pressure on children to become accountants and pharmacists and lawyers. The culture grows around these touch points, especially in such a large community of the like-minded. But the risk aversion does not make sense. It’s hard for anyone to be objective about the way they grew up. So much of childhood goes unexamined until later in life, when there are huge swaths of time available for meaning to slowly reveal itself. Of course only later in life do I come to see how rare the experience of the San Gabriel Valley Asian is. How wonderful it was to grow up surrounded by Chinese supermarkets and famous xiaolongbao and dim sum restaurants, how relaxing to never wonder too much about issues of identity and belonging. I like that in this space, we can be a smug minority who’ve built our own comfortable little world. But I wonder about how we’ve used the safety of this space: from a safe space should come the freedom to do anything, dream bigger, make dazzlingly risky and costly mistakes. To have grown up confident in our ownership of this patch of land should be the safety net we need to take more non-traditional paths. Perhaps it will be the next generation that rebels. It’s strange now to hear of hip, young friends in LA speak of the San Gabriel Valley, surprising to feel that others have taken notice. Mostly they’re referring to a handful of famous dimsum or Sichuanese restaurants. Or the 626 Night Market, which began in the period I was in high school, was earnestly attended by Asian teenagers all over the region, and has since grown into a major (white) foodie destination. It’s become hip to wander from Los Angeles into the suburban ethnic enclaves in search of the dingy, the hidden, the authentic, the mind-blowingly delicious. To surprise friends with how far away from the city center they were willing to drive for something different. Mostly, it’s strange to think that the place you grew up (boring, safe, insular) can be cool. That the elements that were frustrating, such as the homogeneity of the Asian population, can be a thing of intrigue, can invite jealousy from those who grew up the only Chinese kid in their entire grade. And that a hometown, despite its frustrating elements, can grow a kind of pride. I can’t help it. After four years learning about real weather in Chicago, I’m lured to Los Angeles by circumstance and the golden life. I’m unnaturally grateful for things like sunshine I can take for granted, a car to haul my groceries in, my parents’ home and an afternoon lying on their couch a freeway away. I want to take advantage of being in Arcadia for the day; I want to eat some good Asian food. Ivy, just back from two years in Korea, is craving anything else, but we compromise and I get my way because hey, from the other side of town, Arcadia is far! We settle on pho. Not Golden Deli—even though everyone knows they’re clearly the best, and only because they’re currently shut down for renovations—but a different place in Alhambra. I’m driving us to dinner and taking in the changes around Arcadia. There’s a new Metro Gold Line stop now, easily connecting the city to downtown LA. The windmill of the iconic Denny’s building has apparently fallen off in a freak accident. The tennis courts are as packed as ever under the yellow glow of the sodium lights. We’re talking and driving and laughing through these San Gabriel Valley suburbs; it feels like I’ll never know a place as intimately again.